We are a leading Wholesale Trader of single chip video camera, 3 ccd c-mount colour video camera, 3ccd small-sized remote head type camera, 3d full hd medical video camera, hd medical video camera and sony 3 chip full hd camera for microscope model pmw -10md from Delhi, India. We are one of the leading wholesale traders & suppliers of Single Chip Video Camera. 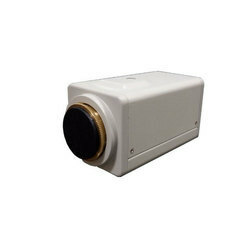 The DXC-390P is a 1/3" type DSP 3-CCD colour video camera which incorporates Exwave™ HAD technology -- a new Sony technology that greatly improves camera sensitivity (F8 at 2000 lx) while reducing smear compared to previous CCD technologies.Using a C Mount lens and providing resolution of 800 TVL and a high S/N ratio of 61 dB, the DXC-390P is ideal for machine vision, industrial microscopy, digital photography, portrait proofing, amusement rides, point of view (i.e., sports shooting) and scientific image capture applications, where picture accuracy and detail are essential. The Sony DXC-C33P camera delivers stunning picture quality in a compact, lightweight design. It provides horizontal resolution at 800 TV lines with a minimum illumination of 2000 lux at F8. It incorporates a DV output terminal, which allows the camera to output images by DV format.In spite of its compact body, this model inherits the superb picture quality of the DXC Series. Its horizontal resolution is 800 TV lines and the minimum illumination is 2000 lux at F8. Also, various features such as DynaLatitude™ function and Partial Enhance are provided in this model. Stereoscopic 3D colour images captured in Full HD with this medical grade camera can assist with providing improved depth perception and spatial orientation compared with conventional 2D. ‘Live’ 3D images can be shared with other consultants, teaching staff and students using a monitor such as the Sony LMD-2451MT (MDD approved) LMD-4251TD (non MDD compliant). 3D Full HD images can also be captured for later analysis, sharing and review using the HVO-3000MT medical grade video recorder.The MCC-3000MT consists of two light, compact camera heads plus a CCU (Camera Control Unit). Compliant with latest medical safety standards, the complete system can be easily integrated into medical environments. Image quality is assured by precision Exmor™ Full HD CMOS sensors in each camera head. Combined with advanced Sony digital image processing techniques, this allows the MCC-3000MT to capture detail-packed 3D images with high sensitivity and signal-to-noise plus wide dynamic range. 2D operation is also possible, allowing surgeons to capture two independent 2D images under control of one CCU. Workflow is enriched with a range of useful imaging features and shooting modes, including Image Reverse and Freeze. Image brightness and other functions for both camera heads can be adjusted intuitively from the CCU front panel. Customised picture profiles can be stored and recalled instantly, avoiding time-consuming set-up between procedures. The system can optionally be controlled via an external PC or other host device. In addition, both camera heads can be sited as up to 20m from the CCU for even greater operational and integration flexibility. 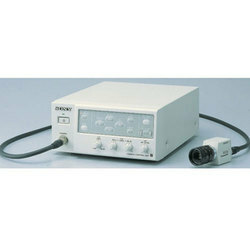 This two-piece HD colour video camera consists of a light, compact camera head and separate CCU (Camera Control Unit). The complete system is designed for convenient integration with medical modality equipment such as slit lamps and surgical microscopes. High quality image reproduction is enabled by latest-generation Exmor™ CMOS sensor technology, offering improved low-light sensitivity compared with traditional equivalent-sized image sensors.Brightness and colour can be easily adjusted from the CCU front panel, while workflow is further enriched with a range of useful imaging features and shooting modes. Customised picture profiles can be stored and recalled instantly, reducing time-consuming set-up between procedures.The complete camera system can optionally be controlled from an external host device such as a computer. In addition, the camera head can be sited as far as 20m from the CCU (requires optional cables) for greater operational and integration flexibility.Full HD video images can be viewed on a connected monitor (not included), or recorded for subsequent sharing and analysis with a suitable video recorder such as the Sony HVO-1000MD. The demand for high-quality image acquisition in surgery and medical observation has been growing rapidly. High-quality images contribute not only to the improvement of surgery, but also conference and education applications. 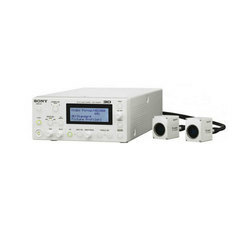 To accommodate this need, Sony introduces the PMW-10MD medical-compliant full HD video camera. 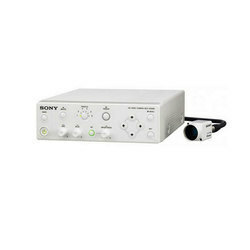 Sony's expertise and knowledge, accumulated over decades as a world-leading supplier of broadcast and medical video equipment, are consolidated in this camera.The PMW-10MD has a compact camera head unit, that can be attached easily either to a surgical microscope, a surgical boom arm, or to a ceiling, and a separated camera control unit. The distance between the camera head and the camera control unit can be extended up to 20 m (62.6 feet).In the camera control unit, there are two SxS PRO memory card slots for recording full HD quality moving images and capturing still images. The PMW-10MD can record up to 280 minutes of high-quality moving images on two 32-GB cards. The SxS Pro memory card provides a number of significant benefits, such as instant random access to recordings, easy editing, and quick copying of footage to IT-based devices - all of which offer tremendous workflow improvements.With its outstanding image quality, extremely long recording time, and a number of advanced features, the PMW-10MD is an ideal medical camera that improves both image quality and operational efficiency.